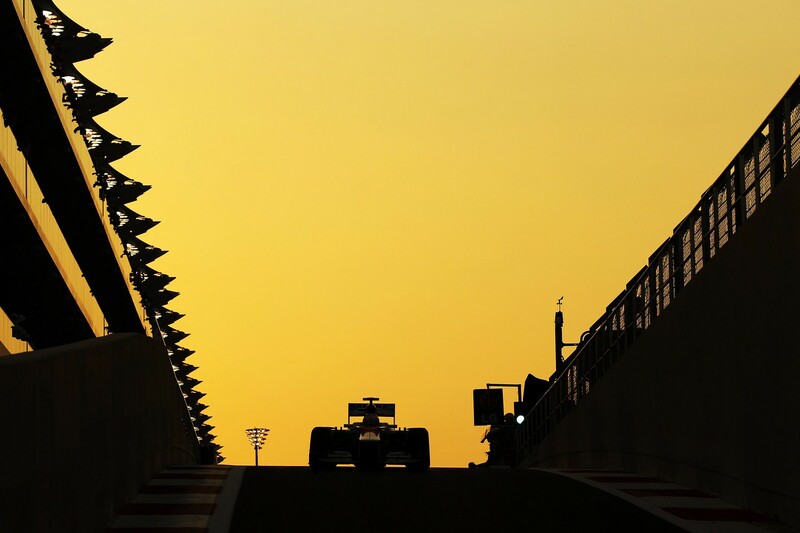 In what proved to be more exciting than last year's Abu Dhabi GP, the 6 hr wait between the end of qualifying and the official decision to have Sebastian Vettel's red Bull start from pit lane because of a fuel violation was punctuated by a relentless twitter war between all the journalist present, and not, eager to give the news first. Amusingly a blogger won. The sequence of events for Red Bull at the end of Q3 was identical to what had happened to Lewis Hamilton earlier in the season, including the frantic call from pit wall to shut down immediately. It's interesting Red Bull would feel under such pressure to put Vettel on pole to take such a risk. Certainly confirms views that Red Bulls can only win if they can start in clear air. Vettel will get a chance to show his stuff tomorrow and climb back into the points, tall order considering it's expected to be a one stop race. Alonso has to keep cool, he can let Hamilton go has to weigh how much to risk vs gain with Maldonado and of course keep an eye on Raikkonen who is still in the championship. We as fans get a championship potentially going right down to the wire and somewhere Bernie is smiling. Vettel now starts from Pit Lane. Agreed. Here I was thinking tonight's race was going to be another Korea, we may see some of the best racing all year tonight. Different set of event's to Lewis in Barcelona, in that case McLaren knew they were short on fuel so they told Lewis to stop to ensure that they had the 1litre sample. 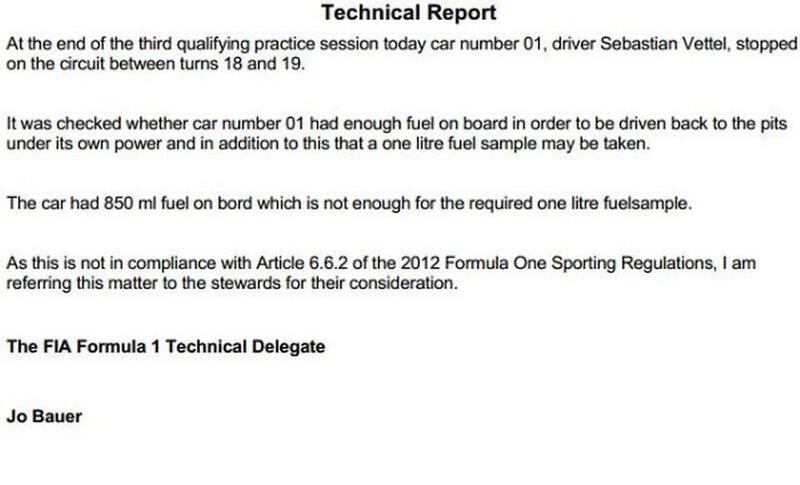 In this case, Renault advised Red Bull to stop due to an engine (fuel pressure) related problem which the stewards accepted was a 'force majure'. Unfortunately when they got the car back to the pits the stewards could not get 1litre out of the car so it was automatically disqualified. You don't know if there are smoke and mirrors going on but it would be very strange for Red Bull to take the risk of purposely under-fuelling the car at this stage of the championship. Makes some ammends for Alonso being taken out at Spa. Red Bull have taken the option to start from the pit lane to allow the chance to make changes to setup for the race.